Although tax rules have permitted spin-offs since the mid-1950s, spin-offs did not occur with as much frequency and within major corporations until the 1980s, when a trend was ushered in by the spin-off of seven regional Bell companies by AT&T between 1982 and 1983. 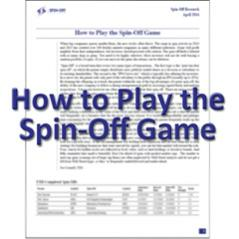 Since the 1980s, the number and value of corporate spin-offs has escalated. Furthermore, whereas spin-offs accounted for under 10 percent of U.S. divestitures in the 1980s, they accounted for almost 50 percent by the late 1990s, and this trend is growing more in this current market environment.